You have to wonder why a dog as well behaved and sweet as Rocky ended up in a shelter. He was about four years old when he was brought into Marshall County Animal Control in Alabama. His hair was matted, and he had been shot with a pellet gun. Did he get separated from his people when they were traveling? Did he simply wander far from his home never to be found? Did his person die and a survivor run him off with a pellet gun? All speculation. 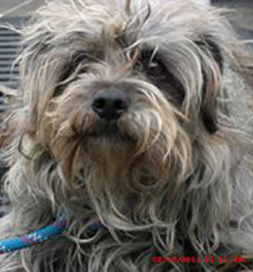 Rocky’s shelter photo shows a woebegone little dog. One thing was certain: he had manners, seldom barked and was house trained. He apparently had a good family at one time, says Lynne Robinson, who adopted him in 2014. She searched on Petfinder and when she saw Rocky’s photo, she knew he was the one. He was being fostered by Furever Friends of the South K9 Rescue while he was recovering from his wounds. Now he’s home and handsome. The first night in his new home, Lynne encouraged him to get on her bed. “After I petted him and then turned over to go to sleep, he jumped off the bed and slept in a dog bed that I had on the floor. I think wherever he used to live, he may not have been allowed to sleep on the bed.” After many months, she convinced him that it was all right to stay in her bed all night. Another thing is certain: Rocky eased Lynne’s grief. “My only son is grown and living on his own and both of my parents have passed away. 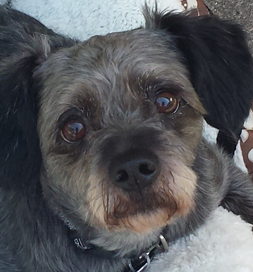 When Mazda passed away, my grief was almost unbearable.” She and Rocky rescued each other.